Home > On Sale > Blow Out - 50% Off! Blow Out - 50% Off! 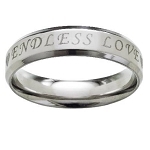 We are constantly making room for new jewelry styles, and that’s why we proudly offer a wide selection of men’s clearance rings to accommodate an array of tastes. Looking for something durable that better represents the modern times? Look no further than titanium, stainless steel, tungsten, tungsten carbide, cobalt chrome, ceramic, and other unconventional materials. Up the ante on your wardrobe and accessories by choosing a ring with a gorgeous two-toned effect with a sophisticated center inlay, carving, or decorative embellishment. We also carry a wide range of handcrafted details, including beveled or faceted edges, bezel stone settings, lasered scrolling, contrasting enamel, and so much more. 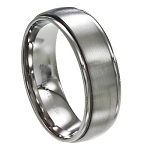 For the man who has everything except a fidget to keep his mind busy, we guarantee he will love our lightweight spinner rings, also known as worry rings. We carry spinner bands with fun tribal or geometric designs that are sure to turn some heads anywhere you go. Browse our last-chance selection of men’s sale rings today to find the ring of your dreams at an incredible price. 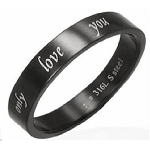 Just remember, the sizes shown are all that is offered in each particular ring style. 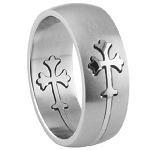 Exchange/Return policies are the same for men’s clearance rings as with all of our rings. If you have any questions about our inventory or need help finding the perfect ring, please contact one of our men’s jewelry specialists for a tailored customer service experience unlike any other. Call us today for further assistance!